Luxury lake front log home located in Cove Pointe community, one of the most desirable areas of Norris Lake. 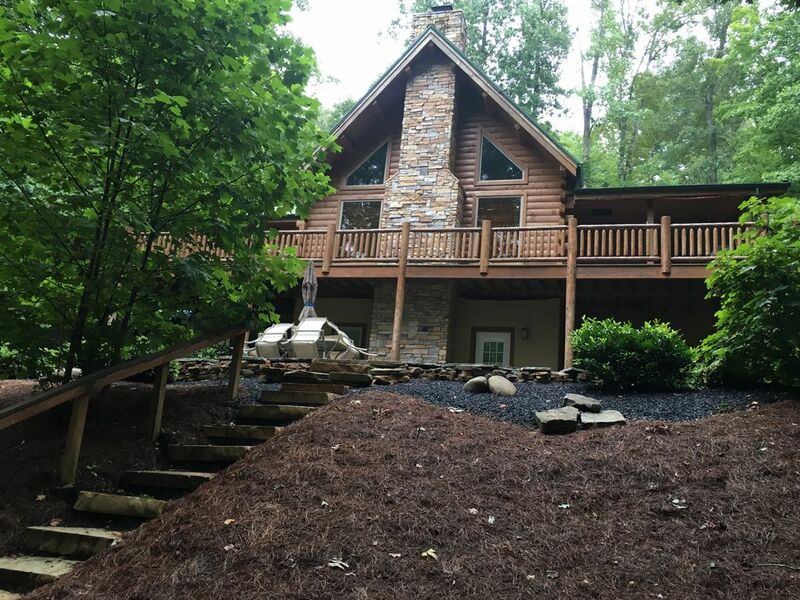 This home is beautifully furnished and sits on a wooded lot. It is in a quiet cove with 200 feet of shoreline and a 30' X 30' floating dock. The cabin features 5 bedrooms (includes the loft). The loft is equipped with two queen size beds, and a wonderful view of the lake. The fully equipped kitchen is open to the great room and dining area. The large lower level has a foosball table, snack area with table for playing cards and games and comfortable sitting area. The back of the home is beautifully landscaped with patio, outdoor eating area with gas grill, and a fire pit. A community boat launch is conveniently located near the home. Bath and beach towels are NOT provided. All bedding, kitchen utensils, pots and pans and dishes are provided. Emergency phone, air conditioning, internet, satellite TV with DVD, dishwasher, microwave, washer and dryer. This vacation home was perfect for our family. It was well maintained, beautifully decorated and very clean. We also appreciated the option to put up a baby gate at the top of the stairs, as it kept our little ones from falling down the steps. The owners also thought of the little things, such as hangers in the closets and a clothesline / with clothes pins on the bottom patio to hang your wet towels; something other vacation homes didn't have. We had at great vacation at a top-notched home. Planning on staying again next year. Thanks!! This was the first time we visited Norris Lake. We were not disappointed! The cabin was wonderful. It was well furnished with a cozy feel. Great location, we took the kids tubing, to the jumping bridge, out for lunch or even stopped for ice cream… everything was with in a 20 minute boat ride. We will return with our family again. Great Cabin! Will stay again! This was the perfect place for our family vacation! The kitchen and dining area were perfect for a family meals. The bedrooms were well furnished and the kids loved having their own area and sleeping in the loft. The house is clean and well maintained. We loved the view of the lake from the deck. The cove was great for swimming. The location was great! We visited nearby marinas, wake boarded, tubed and even found the cliffs for jumping. The owners are great to work with and have done a great job of creating a family atmosphere. We will definitely return! Let's just say.. this home is not ok. The master bathroom ceiling leaked when it rained. Ir ruined several of our personal items. There was broken furniture in the basement(which the owners new about). The owners kept part of our security deposit claiming that we did not clean the place when we left. I will say that we did not start the laundry as indicated but this does not warrant the security deposit that was kept. They did not get back to us in a timely manner when it came to the security deposit. I would NOT recommend this place. We did know a couple of pieces of furniture were not in the best repair. We had planned to replace them at the end of the season. If those things had not been moved (which our policy clearly states) everything would have been fine. We had to make a special trip, 300 miles each way, to put the furniture back that they had moved since the housekeeper could not do it by herself. At that time we placed those pieces. We had the master bath ceiling checked out and could not find any reason for it leaking. We were never given a list of items that were damaged. Our housekeeper, who has been with us from the beginning, sent an email about how bad the house was left. We only kept out of the deposit the extra we paid the housekeeper and returned the majority of it to the renter. My friends and I stayed at Hardy's Hideaway during Memorial Day weekend in 2012 and it was fantastic. The house is beautiful and there is plenty of room. We had a group of 10 for the trip and it was extremely comfortable. The house is set back in a private cove amidst the trees which gives it a secluded, wooded feel. Another great feature is that it is located on a great part of the lake, close to many full service marinas and it is just a short drive from the highway. The house has the rustic look of a log cabin with a very modern and relaxing feel because of all the amenities. You can lounge on the huge sun deck, have lunch down on the patio, swim off the dock in the private cove, or take the boat out for some watersports. There is something for everybody, no matter what age. My friends and I have stayed in many rental properties on the lake and this was definitely one of our favorites and I highly recommend it. fishing. Our cove is ideal for swimming off of the dock. We are located near Stardust and Sequoyah Marinas. The Marinas have a restaurant where you can dock your boat and enjoy a nice lunch or dinner. Discounted Peak Season Weekly Rates (7 Nights) available, please inquire.